The effect of different molecular weights (MW~4 and 1000 kD) and concentrations of Poly (Ethylene Oxide) (0.1-1 %wt) on methane hydrate nucleation time and storage capacity was studied. 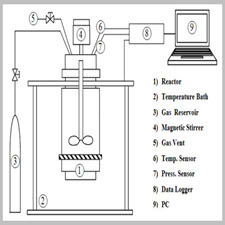 Experimental results showed that PEO (1000 kD) at concentration of 0.5 %wt gives significant kinetic inhibitory performance and at concentration of 0.25 %wt results in highest methane hydrate storage capacity. PEO significantly enhanced the storage capacity of methane hydrate in comparison with the pure water, as one of the main challenge in gas fuel storage and transportation. Gas hydrates are solid crystalline compounds form at low temperature and high-pressure conditions (mostly above the freezing point of water). In hydrate crystals, the non-covalent interactions between gas molecules and water molecules stabilize the hydrate structure . In the oil and natural gas industry, inhibiting hydrate formation by chemical compounds is one of the common methods in lowering the risk of hydrate formation and blockage in drilling, production and flow assurance processes . Various types of hydrate inhibitors, themodynamic or kinetic, have been extensively studied . In the case of kinetic inhibitors, it is believed that water soluble anti-icing polymers such as poly (N- vinyl caprolactam) or poly (N-vinyl pyrrolidone) are efficient KHIs and inhibit hydrate formation and growth via occupying the forming cages by their pendant groups (pyrrolidone group for small cages and lactam group for the large cages) . In the case of poly (ethylene oxide) with high molecular weight polymer, it can act as hydrate formation inhibitors It is reported that non-ionic, water-soluble, linear PEO acts as a weak thermodynamic methane hydrate inhibitor at concentrations of 5-25 % w/w (T= 273.5- 285.3 K and P= 0.187-9.961 MPa) . Furthermore, the role of PEO as a kinetic hydrate inhibitor was less studied in the literature. However, inhibitory performances of PEO mixtures with some low-dosage polymeric inhibitors (LDHIs) on delaying hydrate formation have been investigated. In the present work, the effect of low-dosage poly (ethylene oxide) on hydrate formation was investigated in isochoric methane hydrate formation experiments. Comparative quantitative effectiveness of PEOs on the nucleation time and storage capacity of methane gas hydrate was compared and discussed in terms of molecular weight and low-dosage concentration range of the polymer.